Product #21232 | SKU 214120 | 0.0 (no ratings yet) Thanks for your rating! 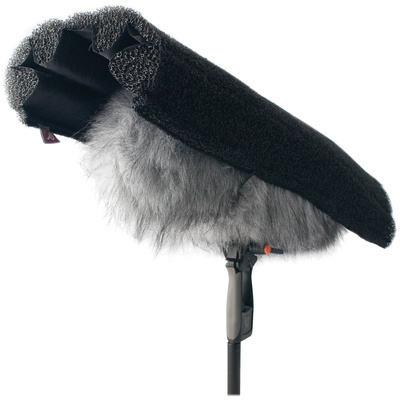 The Rycote Duck-WSAD Duck Rain Cover is an open cell foam accessory with a weatherproof backing for protecting the Rycote Stereo Windshield Kit AD from rain and associated noise. The Duck-WSAD will also mount any 5.70" (145mm) diameter windshield mounted onto a fixed stand. The Duck Rain Cover mounts over the windshield kit and wind muff, creating a waterproof barrier without effecting the microphone's performance. It is simply an indispensable accessory for location shooting in video, film, ENG, EFP, sporting events and more.